Traditionally when I think of Evercool CPU coolers I think about value coolers aimed at the budget consumer, so when the Silent Shark did as well as it did in our testing I was pleasantly surprised. While the Evercool Silent Shark might not be the flashiest cooler available, it gets the job done very easily and should be able to handle pretty much any CPU available today. The lack of "bling" for most people probably isn't a huge concern unless you have a big side window in your case, in which case the Silent Shark isn't the flashiest cooler and might not be your first choice. The build quality of the Silent Shark is great and it should be able to take a bit of abuse and not get all bent up. The whole installation process of the Silent Shark took a little longer than with some other coolers due to the lack of detailed instructions. The entire installation instructions are printed on the side of the box which is a good idea in theory as its much harder to lose the box than a small booklet, but I found that the pictures weren't all that detailed and there were a couple steps that I did incorrectly as a result and made the installation process take longer than necessary. I've installed quite a few coolers over the years and can probably most of the time install most coolers without any instruction, but the Silent Shark did have a couple steps that you can easily do incorrectly and as a result have to redo them until the cooler finally fits. This was my biggest issue with the entire cooler. As far as value goes, MSRP for the Silent Shark is going to be around $75 USD which is pretty standard for a cooler of this size, and when compared to other air coolers that are able to perform at the same level, I would say the Silent Shark is a fair value. At the end of the day the Evercool Silent Shark is a winner thanks to its great performance. In our testing only 1 other air cooler was able to top its performance numbers which is pretty impressive considering the dozens of coolers we've reviewed over the years. The Evercool Silent Shark might not be the flashiest cooler available, but if you are all about the performance you will be very happy with the Silent Shark. 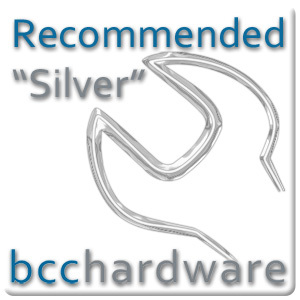 The Silent Shark has earned our "Editor's Choice - Silver" award thanks to its great performance and solid build construction. I'd like to thank Evercool for sending us the Silent Shark CPU Cooler. If you have any questions, comments, or general feedback, please post at the thread below.